1. To make the goujons coating, put the almonds, cayenne pepper, garlic salt and paprika in a blender and pulse several times until the nuts are chopped into smaller pieces, but not a fine powder. 2. Put the chicken breast strips on a plate and pour the coating on top. Using your hands, rub it into the chicken until all pieces are roughly coated. 3. Heat the coconut oil on a large griddle and fry the chicken strips for 5-10 minutes until cooked through, the juices run clear and there is no pink meat. 4. To make the salsa, put the avocado, cherry tomatoes and red onion in a bowl. Pour over the olive oil and lemon juice. Mix well and season. 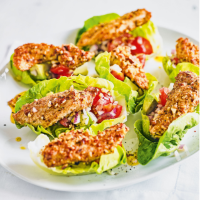 Serve each chicken strip in a lettuce leaf and top with salsa. This recipe was first published in Wed Jun 07 15:39:00 BST 2017.